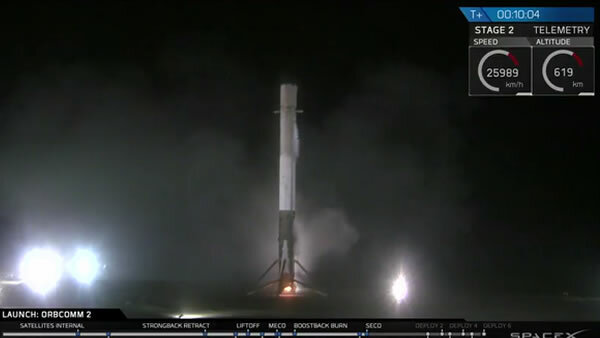 CAPE CANAVERAL, Fla. (KGO) -- California-based Space X has successfully landed an unmanned rocket for the first time. The Falcon 9 touched down Monday night in Cape Canaveral, Florida. Previous attempts ended with crashes. On its previous flight back in June, SpaceX's Falcon 9 rocket failed shortly after liftoff, destroying a supply ship intended for the International Space Station. A snapped strut in the upper stage was to blame. SpaceX spent months correcting the problem and improving the unmanned rocket. It hopes to resume supply runs for NASA in February. Space X founder Elon Musk believes reusable rockets will transform the space industry, allowing travel and living in space to be much cheaper. The company has a contract with NASA to supply the space station and will start transporting astronauts in 2017. Amazon founder Jeff Bezos actually beat Musk in the space race, successfully landing a rocket last month.